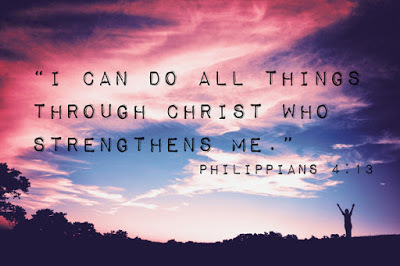 I can do all this through Christ which strengtheneth me. Last night, I had the chance to sleep at night again and it is always refreshing to be able to do so. It’s certainly a lot different sleeping at night than sleeping during daytime. But because I am a night owl and I work at night, I got used to it. 🙂 Today, I woke up at around 6 AM (thank God for waking me up, using my alarm clock). When I checked my phone, I saw Dane’s message on messenger, thankfully, he’s online. Due to both our busy schedules, we don’t always Skype, chat is what we usually do everyday. I found out that today, there was a problem with the bus they use to ride on going to work and going home that the driver didn’t pick them up on time. The time he should’ve spent waiting for the bus to come, should’ve been the time for him to rest already. Because Dane works abroad now, I learn to realize even more how difficult the works of our OFWs are, but they don’t have a choice, they carry on, they survive, and they try their best at their jobs, no matter how tiring it is. And for that, hats off to all OFWs. If you know someone who works abroad, specially a member of the family, please do not forget to thank them for their sacrifices. It isn’t easy being there…away…and most of the time…alone. I know Dane is tired but he told me “kakayanin”. I gave him this simple verse from Philippians 4:13, a very common verse that most of us know. “I can do all things, thru Christ which strengtheneth me”. We cannot lean on our own strength, it is God that renews it day by day. Yes, we can take vitamins that supplements and helps give us strength everyday, but these are just tools, everything comes from the Lord. God is our only source of strength, we should always thank Him for renewing our strength daily. And to all who are working hard for their family, where giving up isn’t an option, please know that with God’s help, we can do it! May we all have a blessed Sunday! What should I be looking for in Food Supplements? Great Read! As long as we put God in our life we can surely do it whatever we want. I find this verse so inspiring. It gives me strength and faith whenever I encounter difficult times. I have it saved on my phone. With God, everything is possible. May He continue to strengthen your relationship. It is great that GOD makes everything possible. Great Faith and believe will produce miracles. So true. With God everything is possible. Our OFW are living heroes. They sacrifice a lot for their families kaya we should pray for them and be strong for them too. May God always protect your husband and your family. Thank you! That's one of my prayers too. That's so true! Thank you, Lord! Thank you sis! Now that Dane is away, it makes me appreciate the OFWs even more. Yes, grabe ang sacrifice nila para lang pamilya nila.